Art Moves 2009 took on a new, large dimension – over 1000 m2 of art was exhibited in the urban space! For the first time we displayed huge works of art mounted on blocks of flats. 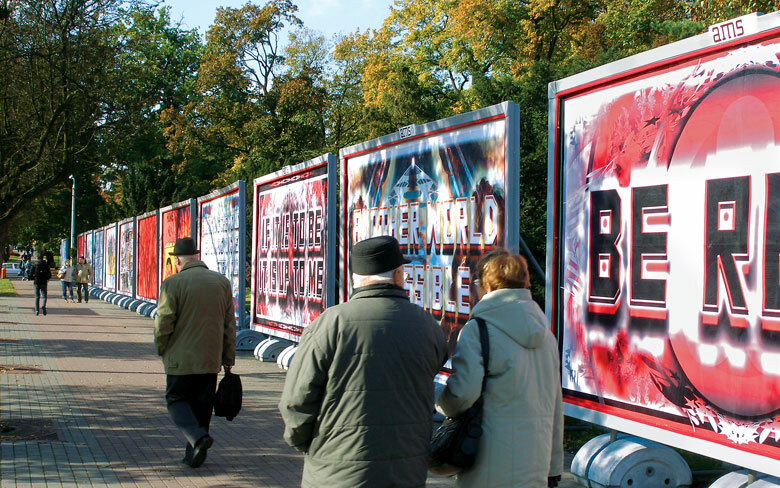 The largest of the festival’s works – a mega billboard by Edward Burtynsky, was over 250 m2 and it was displayed on the building formerly housing the Culinary School, at the intersection of Sienkiewicza and Broniewskiego streets in Torun. During the festival, works of twenty artists from eleven countries of the world (Australia, Canada, United Kingdom, Israel, South Africa, Slovakia, China, Russia, Hungary, United Arab Emirates, Poland) were presented in two sets – the main set and the contest set. selected ten best works which were exhibited in the competition component of the Festival. The author of the most interesting work – Barbora Novotna received an award of PLN 7,000 funded by the Marshal of Kujawsko-Pomorskie Region. Every year we strive for the festival to become a meeting place of all people united by the social approach to art. In 2009 we organized a meeting with artists and art curators entitled „Art for Art’s Sake or Art for People: Actions Surpassing the Rigid Borders of Art, Boldly Interfering with the Social Tissue”. Such initiatives are important since they create an opportunity to share experiences and to get to know noteworthy actions in the public realm better, as well as they become a conveyor of new ideas. During the festival a documentary feature film was shown, perfectly and in a beautiful way supplementing the works of Edward Burtynsky displayed in the urban environment. The film told a story of the artist’s trip to China where his festival works, among others, were created. Another new event at the festival was an art poster action entitled „Art close by” involving the people of Toruń, particularly residents of the Bydgoskie Przedmieście and Old Town districts. The residents were invited to become part of the art exhibition space by displaying posters (specially produced for this purpose by Galeria Rusz) in their house, shop or office windows. A very emotional event for us was the exhibition celebrating 10 years of the Rusz Gallery entitled: „Ołowiany Charakter” (Leaden Character). This exhibition was a special event preceding the festival and was thought as a specific, unique introduction to it.